In the summer, we bid farewell to those music students who graduated with their BMus degrees and have now moved on to varied and exciting careers in the musical arts, such as orchestral management, music publishing or assistant music artist manager among others. As the new academic year is about to start, we also prepare to warmly welcome back the cohort of music students who have just completed their placement. This annual cycle, which marks the natural progression of moving back and moving on from University, not only prompts us to embrace change but also celebrate students’ personal and professional development. So, let’s take a moment to reflect on what Surrey music students achieve, what they cherish most about their placement experiences, and how they use the knowledge and skills they have gained to manage the remaining period of their academic studies, and ultimately to be successful in their job search after University. The excerpts below are students’ own testimonies and give a taste of learning experiences during the professional training year, and of the benefits of doing a placement as part of the music BMus degree. Working at the London Sinfonietta over the past year, I had the opportunity to meet and collaborate with some of the most prominent and acclaimed composers and musicians in the contemporary music circuit. 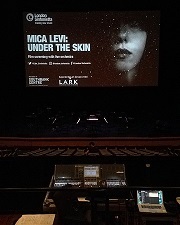 One particularly memorable event was working to manage the concert tour for Under the Skin, where I met the film composer Mica Levi – an oscar nominated composer for the film Jackie. Being part of the hard-working team that managed the concert tour was an immensely enjoyable learning experience. The repertoire performed by the London Sinfonietta is usually complex contemporary music that takes great skill, dedication, and well-coordinated rehearsals to pull off successfully. It was a unique way to learn about such compositions as In Vain by Georg Friedrich Haas and Poème Symphonique for 100 metronomes by György Ligeti. For Haas’s work, the players had to perform in pitch dark for about 20 minutes, something that transforms your understanding of conventional performance practice and opens your mind to new possibilities that musicians can explore. Core to the creative mission of the London Sinfonietta is to offer audiences unique and unrivalled experiences of live music, and during my placement I have learnt to appreciate enormously contemporary repertoire that I may not have had a chance to access otherwise. This experience has wetted my appetite to learn more about contemporary concert music. My professional training year was an invaluable experience that truly allowed me to gain an insight into the inner workings of the music publishing world. Not only did the experience give me a greater understanding of the arts, and how organisations operate in the sector, but it also equipped me with the translatable skills – researching and writing – that I use daily in my job today in the charitable sector. Each day of my placement at Faber Music Publishing was varied; from promoting new works at concerts, attending rehearsals of upcoming pieces, right through to writing to international performers, conductors and orchestras about our catalogue of works. I devoted a lot of my time to the generation of ideas and research, helping the company, for instance, to innovate and update its online scores perusal website. My advice to all students on placement? Make the most of all opportunities given to you and experience as much as possible of the organisation that you are in. Whilst I was based in the Promotions Department, I ensured that I spent time with the Editorial and Copyrights team in order to soak up as much of the company activity as possible. This led to completing projects for a number of colleagues, and I could then add this experience to my CV. More experience on your CV means you have more to show to future employers, and demonstrates that you have been proactive about widening your skillsets. In essence, the main asset of the placement year is that you leave University with one year’s solid work experience in addition to the three years of academic study. The other benefit is that it gives you a taste of the sector, so that you can make informed decisions about what path you want to take afterwards. On my placement year I discovered a love for researching and writing. These skills and interests are what I focussed on when applying for jobs after University. In addition, you form special relationships with colleagues who can become, in my case, great friends and mentors that help guide you after leaving University. The placement year was a great passport for my future success. It gave me the type of work experience, which made me stand out from the crowd after graduating. The placement year provided me with the insight I needed in order to make decisions about my future career. Most importantly it gave me a refined set of skills that have been so beneficial to securing employment – skills like professional communications, organisation, team-work, research, written communication. In the professional environment of the placement you can develop and fine-tune these skills ready for employment, but also for returning back to University for the final year of study. I am a big advocate of the professional training year. It’s great fun, definitely challenging, but ultimately so rewarding! As another annual cycle of professional placements is set into motion, we look forward with passionate curiosity, admiration and enthusiasm to what our music students accomplish, and how they transform and blossom during their learning journey.